City officials plan to launch a curbside composting program and construct the city’s first processing facility in the coming years. D.C. planners want to build a 10- to 20-acre processing facility and begin a curbside composting collection to help decrease the District’s waste stream within five years, according to city documents introduced to the D.C. Council. At a Foggy Bottom Association meeting last month under the theme of “clean community,” city agencies touted the program as a way to reduce waste in the area and combat the city’s persistent rat problem. Neighborhood residents have long complained of a swelling rat population and city leaders said that composting food waste – rather than letting it rot in trash cans – would cut down on the number of rats swarming the area. The new measures were announced about a year after the city introduced a food waste drop-off program, allowing residents in all eight wards to drop off food waste at eight designated farmers markets on Saturdays. City departments collected nearly 100,000 pounds of food waste since the program began last April, according to the documents. Foggy Bottom residents can drop off food waste at the Dupont Circle Farmers Market or on Fridays in Kogan Plaza as part of a University pilot program. 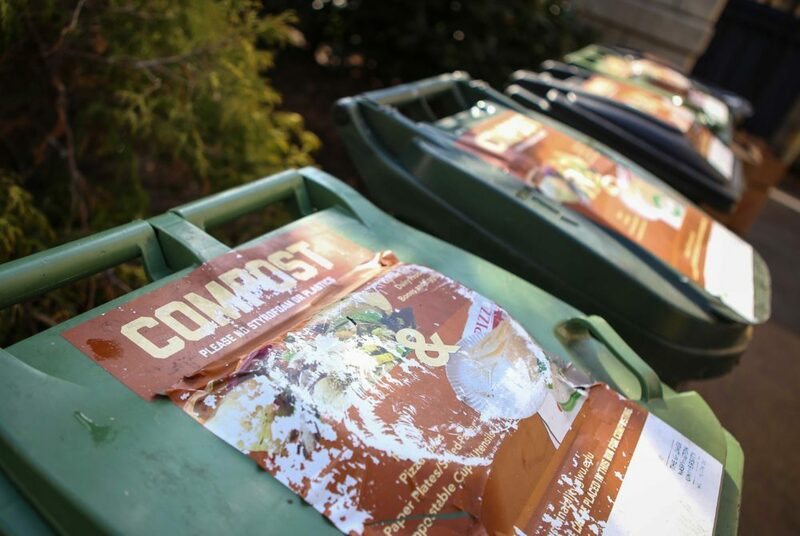 Detrick Campbell, a junior and member of the Foggy Bottom and West End Neighborhood Advisory Commission, said the composting initiatives are a way to fight climate change. He said composting can bring the commercial and residential portions of Foggy Bottom together to clean up the neighborhood. Annie White, the manager of the Office of Waste Diversion at the Department of Public Works, said the long-term city budget allocates $8 million to build the new processing facility – part of an effort to reduce 80 percent of the city’s waste from residential, commercial and industrial sectors by 2032. She said having a facility to process compost is essential because organic waste constitutes about one-third of the District’s total waste. The new facility and curbside pick-up program will reduce greenhouse gas emissions because organic waste in landfills produces methane gas, a major contributor to climate change. The program will also potentially create up to 114 new full-time jobs, according to city documents. DPW hasn’t determined where the facility will be constructed because that decision will depend on what aspects of the design, layout and job creation are the most important to the department, White said. She did not provide a timeline for the decision or the project in general. Last year, the agency introduced initiatives to educate and motivate residents to participate in the program, like recycling webinars, composting information pamphlets and a redesigned Zero Waste website. DPW expanded the city’s recycling program in January to include hot beverage containers, pizza boxes and paper plates. Harlin Savage, the communications director for Eco-Cycle – a non-profit based in Boulder, Colorado that focuses on developing zero-waste policies and programs – said composting programs that have been enacted in cities in his state have been successful because they help the environment and reduce waste. It is essential to have sufficient infrastructure in a community to process the compost because transporting it further away could create even more carbon dioxide emissions, Savage added. Frank Franciosi, the executive director of the U.S. Composting Council, a non-profit organization that supports the composting industry, said living in an urban area can disconnect people from the environment, but composting programs make communities more environmentally conscious and create local jobs. Although there are costs in the short term to implement, organize and promote the program, he said the long term benefits outweigh initial costs. “You want clean air in your city, you want clean streets in your city and I look at it as being part of the community that is more environmentally conscious and more in touch with their impact on the environment and where they live,” Franciosi said.